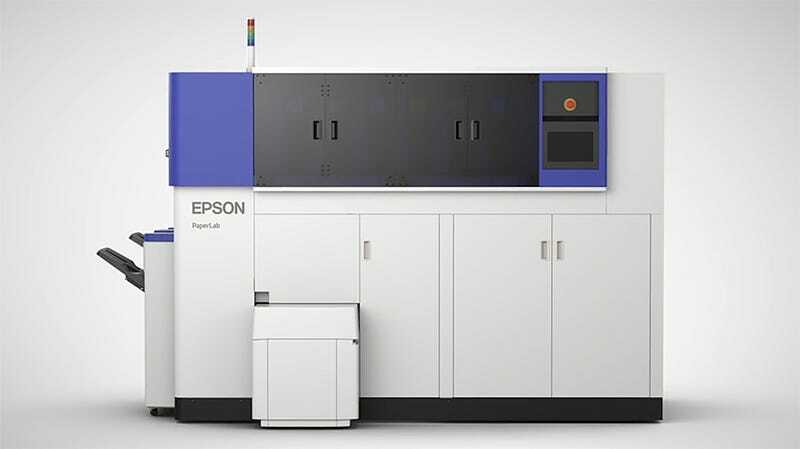 This is PaperLab: Epson says it’s the world’s first recycling system to take waste paper and instantly transform it into new paper—onsite, in your office. A mere three minutes after loading the waste paper, PaperLab spits out a clean recycled sheet—all you have to do is press the start button. PaperLab can produce about 14 A4-sized sheets a minute, and 6,720 sheets in a typical 9-to-5 day, the company says. Different sizes are available, too, and apparently business cards and even scented stationery are on the table. Recycling paper onsite has another convenience: Extra security. Instead of slicing those top-secret sales briefs into ribbons, or hiring a contractor to dispose of them for you, this printer pulverizes confidential into minuscule fibers. It uses Epson’s “Dry Fiber” technology, as opposed to using water, as is standard in the recycling process. The printer turns scrap paper into tiny fibers, and then binds the fibers back together to form new paper. A PaperLab prototype will debut next week at the Eco-Products 2015 conference in Tokyo. Epson hopes to have the printer in Japanese offices as early as next year, and will announce plans for selling in more countries down the line. We look forward to a North American release. It’ll probably be like that Mad Men episode when Sterling Cooper got a Xerox machine.